Ahhh, Buster Douglas Boxing. This is one of those games I’ve always tried to like and play ever since I was a kid, but I’ve always found it tedious after the first few matches and just ended up turning it off. And I did this for good reason too, as this game is nothing special. 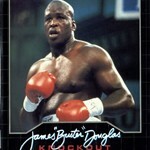 James “Buster” Douglas Knockout Boxing is a boxing game developed by Taito and published by Sega right in the Michael Katz “celebrity sports” era in 1990, as part of one of the famous games in the “Genesis Does” campaign. It stars the then-famous Buster Douglas right after he beat Mike Tyson in the championship. It was originally a game called Final Blow made in 1988 for arcades and the only difference between the two games is really the addition of Buster Douglas and another boxer. The two games are actually very similar in terms of gameplay, graphics, and sound. In Buster Douglas you have five boxers to choose from. You have Buster Douglas, Dynamite Joe, Fernando Gomez, Kim Nang, King Jason, and the Ironhead. Right off the bat you can tell how generic these guys look and feel when compared to Buster Douglas. It’s as if though they were literally trying to fill one of each racial stereotype just to keep audiences happy. The gameplay is basically a side-scrolling boxing game. You move left to right, and just punch. You have a jab, a haymaker, and a dodge/crouch. That’s pretty much all you’ll be doing when you’re playing this game. Each boxer has a life meter that takes damage oddly, and a simple boxing style rule of three 99 second rounds. You win either by KOing your opponent, TKOing your opponent, or winning by split decision. It’s just straight-up boxing. There’s no zaniness to be found here, no special moves, no crazy looking characters, just boxing. In the arcade mode, you simply just fight different boxers in a sort of career-like way. You fight one boxer, and then you move onto the next boxer and fight him, and so on and so forth. Each of the fights is grouped into a different category in terms of the way you have to win. There are championship fights, defense fights, and others. Championship fights are the only ones that truly feel like boxing matches, the rest all have these different gimmicky ways of winning. For example, in defense matches your opponent blocks for most of the round and you have to somehow find the hole in his defense and exploit it. There’s not much action there. This is where the game gets boring for me. After the championship rounds (the first four or five fights of arcade mode) the game gets extremely dull and boring. There’s no appeal really that makes me want to keep playing. The gimmicky rounds are horrible, since your opponent just stands there and waits, or keeps doing the same pattern over and over again. Not even some random movement to change things up. There is a two-player mode in the game as well, which is a plus, as it gives you some fun games with a friend that probably won’t be as boring as the single-player mode. The graphics and sound don’t do much to help this game either. The boxers and referee look good. They are very detailed, large, and crisp. The boxing rings that the game takes place in don’t change however, unless you count the change of the referee’s skin color. The backgrounds are simple spectator crowds with some occasional camera flashes. The sound is a rather weak point in this game. There’s almost no music, save for the title screen, character select screen, and… the pause screen? I really would like to know whose genius idea it was to put a full-score on the pause screen of all places in the game when there isn’t any music during the gameplay! There are also all of about two sound effects in the entire game: The bell ringing at the start and end of each round, and the punch sound when you either hit your opponent or swing at thin air. This makes the game very silent throughout gameplay. And when games get silent, they get boring. In conclusion, Knockout Boxing is bland and boring. If you like boxing, give it a try, you may like it. But Greatest Heavyweights is a much better game if you’re looking for some true, honest- to-goodness boxing.